Kissa tyrol is located at 5 minutes by walk from Nijojo-mae station. You will be greeted with a warm smile mom. Chairs and tables in the Kissa tyrol are retro, and these make us nostalgic feeling. There is crowded with many people even though weekday. Various type of menu such sandwiches, breads for morning, katsu curry, dry curry, or pastas, and opening hour is long (6am-7pm) so, we can visit Kissa tyrol with multi purpose. The big and crispy roasted katsu(deep fried pork) are topped. A roasted katsu is thick and fresh. Curry taste is spicy and has plenty beef which is cooked well. It is a really big size curry, so I recommend it when you are hungry. Salad is a side menu. Actually it is a big size, so enough for 2 people. Vegetables are really fresh and have natural sweetness. Since curry is little bit spicy, fresh and mild vegetables make you refresh. It goes with sesame dressing which is served with a separate container. Curry sauce topping is a unique style. Curry and toast are served in separate. At first, please enjoy toast only, and then please add curry sauce as you like. The combination of mild butter and spicy curry is perfect. Curry sauce has onions which are cooks well, it makes curry sauce mild. 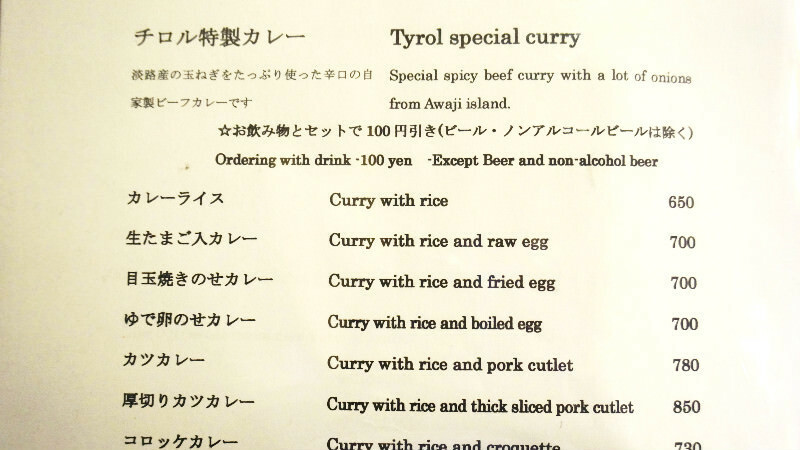 It is an extremely different type curry dish with a pork cutlet curry or a curry toast. A spaghetti has plenty ingredients such green onions, beef and mushrooms. And each ingredients are mixed well with curry, and entangled with pasta. It is not so spicy, but curry flavor is tightly. I want you to try, because it is a rare menu. Lunch set menu is available from 11:30am - . When you leave the café, please say to staffs 'OOKINI'. It means ' Thank you' in kansai dialect. You can enjoy local atmosphere with this greeting. This is my favorite curry restaurant in Kyoto! The curry here is like homemade, simple and plain, but sometimes I just get the urge to eat it and head for Kissa Tyrol. My recommendation is curry over rice with deep-fried pork cutlet, topped with a fried egg. If you go see Nijo-jo Castle, I hope you also visit Kissa Tyrol! 5-minute walk from Subway Nijojo-mae Stn.